EPOS is pleased to present the novelties for 2018! Have a look at our latest in-house creations. 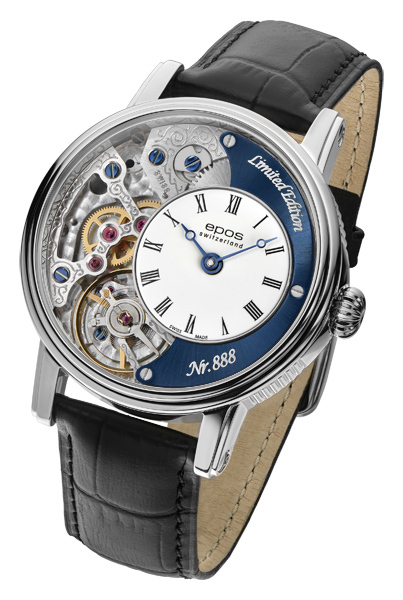 The by EPOS’ own engineers refined version of the Verso timepiece still shows the beautifully finished backside of the Unitas 6497 movement in the front. But now it is equipped with a sophisticated threepart stainless steel dial, to take the already impressive Verso timepiece to the next level. This exclusive special edition is limited to 888 pieces worldwide. Modified mechanical hand-wound semi-skeleton movement Unitas 6497, decorated and engraved. 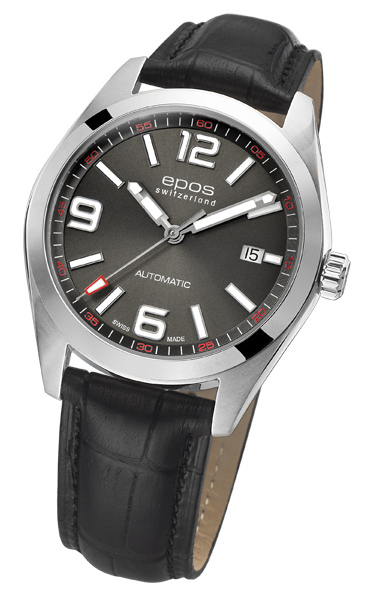 Refined version of Verso timepiece by EPOS’ own engineers. Stainless steel or rose PVD case with anti-reflective sapphire crystal. Pulsometer on back side. Water resistant 5 ATM. 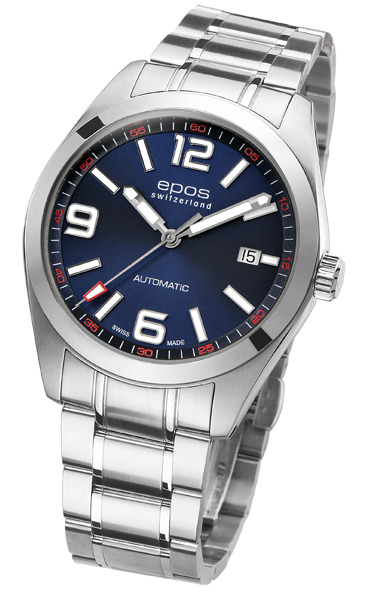 Sophisticated three-part stainless steel dial, available in blue/white or black/white. Leather strap. Diameter: 43.5 mm, thickness: 11 mm. 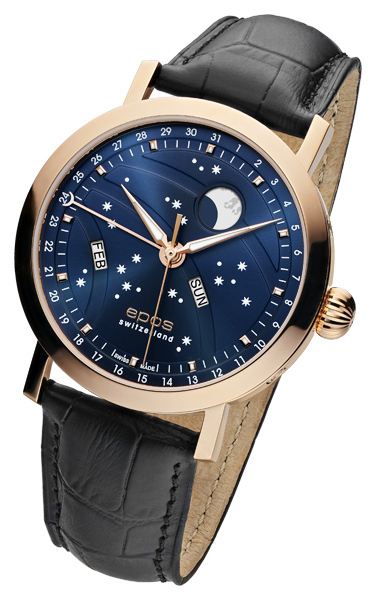 EPOS has developed an in-house big moon complication as an exclusive novelty for 2018. Powered by a well-known mechanical self-winding ETA 2892 movement in a wonderfully decorated execution, the timepiece is equipped with several special features. The oversized moon has been moved to the top of the watch to give it a more prominent position. Moreover, the moon and the printed stars are both equipped with high-quality luminous colour which lets them glow in the dark. Mechanical self-winding movement ETA 2892, decorated. 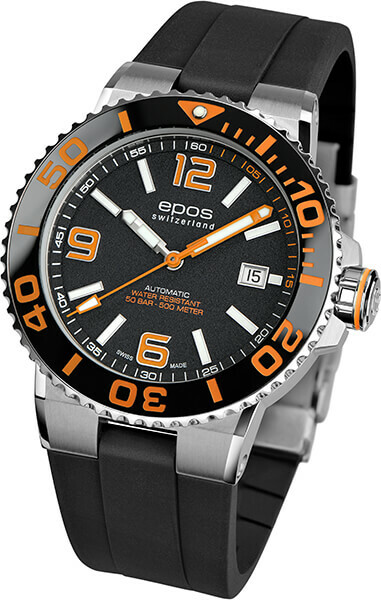 Epos original module EPBM. Phases of the moon, date-pointer, day of week and month indication. Stainless steel or rose PVD case with anti-reflective sapphire crystal and see-through back. Water resistant 5 ATM. Blue sunray or dark grey sunray dial with luminous stars and extra big luminous moon phase. Leather strap. Diameter: 42 mm, thickness: 11 mm. 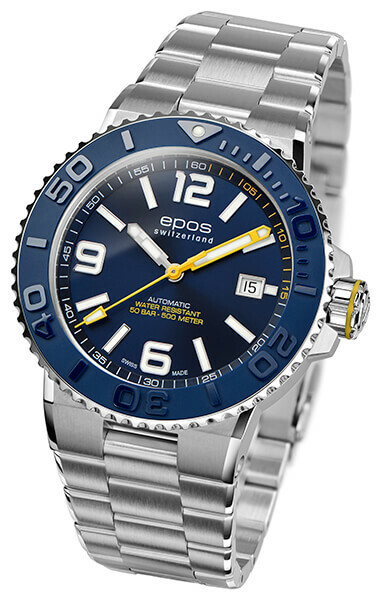 EPOS is proud to present a new sportive timepiece, which satisfies the highest requirements of a diving watch. 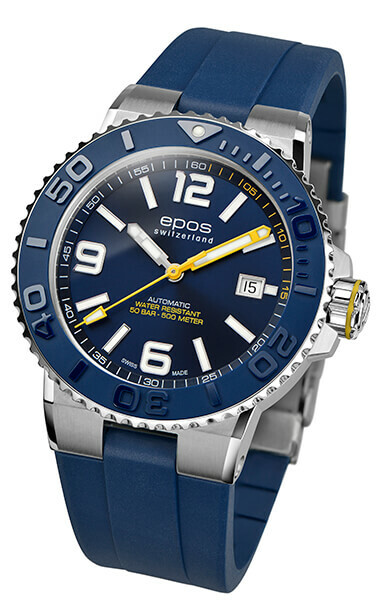 For this masterpiece, EPOS’ engineers put special focus on the beautifully manufactured case: The housing of the new ‘EPOS 3441 Diver’ model is extremely robust and embodies the latest and best features of a modern diving watch. 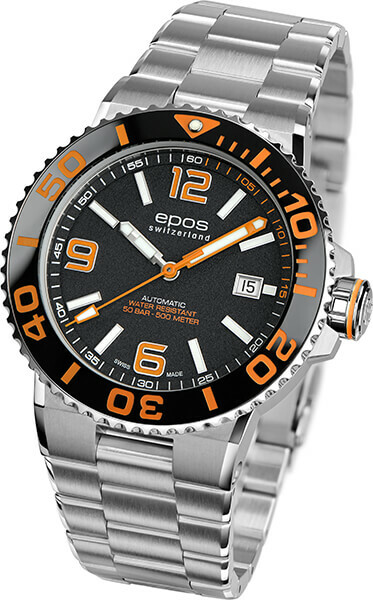 The main attraction of the case is the black, blue or orange colored ceramic bezel. Featuring an integrated helium valve, the timepieces has a water resistance of remarkable 500 meters. Mechanical self-winding movement ETA 2824. Date indication, unidirectional turning bezel. 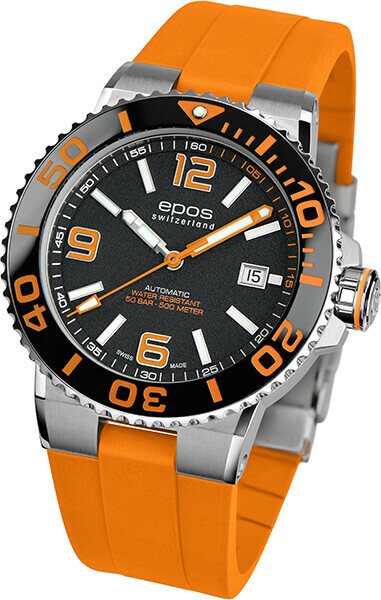 Sophisticated stainless steel case with either a black, blue or orange relief ceramic bezel and domed anti-reflective sapphire crystal. Water resistant 50 ATM, equipped with a helium valve. Dial available in black sandblasted or blue sunray, with applied Arabic, hand-set luminescent figures. Rubber strap or stainless steel bracelet. Diameter: 43 mm, thickness: 14.5 mm. With this new addition to the Sportive collection, EPOS launches a high-quality sports watch at an affordable price. The dark grey or blue colored dial, both with a stunning sunray finish and hand-set luminescent figures are leading to a nice sportive appearance of the watch. Mechanical self-winding movement ETA 2824. Date indication. Stainless steel case with anti-reflective sapphire crystal. Water resistant 5 ATM. Dial available in blue or dark grey sunray, with applied Arabic, hand-set luminescent figures. Leather strap or stainless steel bracelet. Diameter: 39 mm, thickness: 10.2 mm.